In many ways, 2004's Star Wars "Saga" Bossk (Executor Meeting) isn't that much of an upgrade from the 1997 POTF2 figure. It's definitely better, but we sort of expected a little more out of Hasbro. Will you agree? Let us know in our Research Droids Reviews today. Be sure to leave your own thoughts in our comments section, vote in the poll or even leave comments about it on our Facebook page. Click the banner below for the direct link to the review! As always, you can also send your own personal review requests via email if you'd like to see something that we didn't cover yet. 237 Unpublished/Lost Photos From The Lucasfilm Archive! With special thanks to our friends at BanthaSkull.com for alerting us to this fascinating exclusive article, click through to check out 237 never before seen prop images from the Star Wars Original Trilogy and other films. OriginalProp.com has the story! Tonight we take a look at one of the Sideshow Collectibles Sixth Scale offerings: Yoda (Jedi Master). Click below to take a look at our detailed Visual Guide of this figure and its many poses and accessories! For even more information, we break this figure down from top to bottom in our Research Droids Review! Is It All Smoke And Mirrors? What Gives? There is a new Snowtrooper commander coming in The Black Series line too, but see how it all started by checking out Snowtrooper (The Battle Of Hoth) in our Research Droids Reviews today. Be sure to leave your own thoughts in our comments section, vote in the poll or even leave comments about it on our Facebook page. Click the banner below for the direct link to the review! As always, you can also send your own personal review requests via email if you'd like to see something that we didn't cover yet. If you are looking to fill some holes in your The Vintage Collection set, check out Amazon to see if you can find some good deals! Mace Windu is currently $7.35, and won't last long (6 left as of this post). You might be able to find some other deals too, including the Star Wars Villian Special Action Figure Set for $9.72. See all of The Vintage Collection right here! Thank you JTA reader Michael for the tip! Probably the most disappointing news of 2013, aside from the cancellation of The Vintage Collection, was the cancellation of the Legacy Collection  line (which ironically didn't even get off the ground before its demise was announced). From July 2012 through February 2013, Hasbro kept telling us Legacy Collection  was coming and announced what the first two wavesof this new line would be. Collectors began anticipating when they could expect these figures to start hitting. What was supposed to be availability in the first quarter of 2013 ended up being a canned line. We all know ultimately what happened however. And history has been made. Hasbro scrambled to create a new collector line and that became The Black Series, a collector focused line that wouldbring us most of the cancelled LC2 line as well as new surprises. Despite its surrounding controversy, The Black Series basic figure line is now looking up and it appears to ge better and better as the months move forward. We decided to put together a little state of the union address for where we are with those two dozen figures that almost ended up in limbo. Are you interested? Then click through for more! If Hasbro was ever gracious enough to update a new General Rieekan action figure in the future, they better use the head sculpt from this figure. Years ahead of its time, see why we're deeply in love with General Rieekan With Hoth Tactical Screen (Hoth Evacuation) from the Ultra line. It's all in our Research Droids Reviews today. Be sure to leave your own thoughts in our comments section, vote in the poll or even leave comments about it on our Facebook page. Click the banner below for the direct link to the review! As always, you can also send your own personal review requests via email if you'd like to see something that we didn't cover yet. Are You Finding Anything New That You Actually Want To Buy At Retail? It seems that there are many collectors finding new figures in stores, like JTA reader Brian R., but I can attest to the fact that this isn't happening in my area.... at all. For me, the only thing that has hit hard is Mission Series wave 2 are they're not selling at all. Two full cases have arrived and I think one C-3PO/R2-D2 set has moved out. Let us know what's happening in your areas too in our comments. Click through for more! 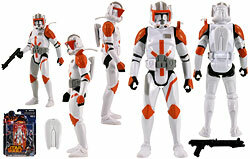 Clone Commander Cody is the last Saga Legends Wave 2 entry into our Visual Guides. Click below to check out the latest version of Cody, and read our review to find out why he didn't score very high in our eyes! Proving once again that you just never know what you may find at retail, check out a recent store find from JTA moderator flaming toilet. Click through for more! Darth Plagueis Found At Walgreens! Not finding any new The Black Series basic figures? Check your local Walgreens then! JTA reader Jonathan S. sends us proof of what rare figures you can find at this pharmacy chain! Click through for more! The timing is great as a new version of this is now imminent in The Black Series line. Still, check out this must-have figure to complete the Wampa With Hoth Cave (Hoth Attack) Ultra figure, our review yesterday. It's not perfect, but it does what it's supposed to do. Also, it's not often we do this, but we recreated a frame by frame Wampa attack sequence in our photo gallery for the Luke Skywalker (Hoth Attack) figure. Let us know what you think! It's all in our Research Droids Reviews today. Be sure to leave your own thoughts in our comments section, vote in the poll or even leave comments about it on our Facebook page. Click the banner below for the direct link to the review! As always, you can also send your own personal review requests via email if you'd like to see something that we didn't cover yet. The Saga Legends Stormtrooper is not perfect, but it does give you somewhat of a Vintage warm-and-fuzzy feeling. Click below to check out our Visual Guide for yourself, and find out its flaws by reading up on the finer points in our Research Droids Review! Big Bad Toy Store posts their latest newsletter. Click through for all of the details. You can also get daily product news and updates by subscribing to BBTS's Facebook page and Twitter feed! Star Wars fans: please welcome Chopper to the Star Wars universe. StarWars.com has the full story. Does anyone else think he looks like R4-H5's cousin? There's been some great Episode V TBS reveals, so let's do a Hoth mini marathon of Star Wars "Saga" product to celebrate it (maybe all will be updated). First up is the somewhat awesome Wampa With Hoth Cave (Hoth Attack) Ultra release, an action figure meant to be interactive with another (clue: tomorrow's review). See this wonderfully accurate interpretation in our Research Droids Reviews today. Be sure to leave your own thoughts in our comments section, vote in the poll or even leave comments about it on our Facebook page. Click the banner below for the direct link to the review! As always, you can also send your own personal review requests via email if you'd like to see something that we didn't cover yet. We continue with the Saga Legends wave 2 updates. Next up is Captain Rex. Check out our Visual Guide by clicking below. Don't forget to read our review right here and decide for yourself if these Saga Legends figures are for you! BREAKING NEWS! Jedi News Reveals Leaked Figure List! Our friends at JediNews.co.uk have an incredible leaked rumor list of MANY upcoming figures (and many confirm our rumor reports)! Click through for more!! A slightly surprising update for the time, see why the TIE Fighter Pilot (Battle Of Yavin) figure didn't make the mark in our Research Droids Reviews today. Be sure to leave your own thoughts in our comments section, vote in the poll or even leave comments about it on our Facebook page. Click the banner below for the direct link to the review! As always, you can also send your own personal review requests via email if you'd like to see something that we didn't cover yet. K & C Collectibles has added LEGO sets from 2003 - 2008, Master Replicas display case, Vintage (1980) Coke / Burger King Trading Cards and photo stickers, Star Wars Valentines, Vintage Playset and much more. Click here for a complete list of recently added items. The all-new Saga Legends line has been controversial for sure! Nevertheless, we're here to bring you a detailed look at both the good (and the bad) from this line! Judge for yourself by checking out the latest from Wave 2, with our first look being Boba Fett. Click below to check out our full guide. We ran through the reviews last week for this wave, so stop by and revisit the review for Boba Fett! OK, we are just a few weeks away from NY Toy Fair. It's become almost annual for us to offer you a chance to post your questions in our comments and then we take them back to Hasbro and do our best to get them asked and answered. Timing is expected to be extra tight this year, so please click through for our rules of how this will go down and then once your read the rules, please feel free to post in our comments. JTA sponsor Dorkside Toys writes in with the latest arrivals, pre-orders and clearanxce merchandise. Click through for more details! Hey, did you know you can "almost" get both outfits of General Jan Dodonna (Battle Of Yavin) by getting another figure in the Star Wars "Saga" line and swapping parts? See how this is possible and check out a great figure in our Research Droids Reviews today. Be sure to leave your own thoughts in our comments section, vote in the poll or even leave comments about it on our Facebook page. Click the banner below for the direct link to the review! As always, you can also send your own personal review requests via email if you'd like to see something that we didn't cover yet. 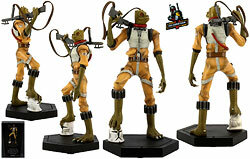 Our next Jumbo Vintage Kenner Figure to make its way to our Visual Guides is Bossk (Bounty Hunter). Click below to explore the Visual Guide, and click here to read about Bossk in our review! A decent pilot figure from 2004 was Dutch Vander Gold Leader (Battle Of Yavin). See why we still have some affection for it in our Research Droids Reviews today. Be sure to leave your own thoughts in our comments section, vote in the poll or even leave comments about it on our Facebook page. Click the banner below for the direct link to the review! As always, you can also send your own personal review requests via email if you'd like to see something that we didn't cover yet. Check out The WolfPack Podcast #44: Times Are Changing, with special guest.... me. Hear a fun chat where we talk about the future of Star Wars, the rumors of the Star Wars brand like The Black Series and Star Wars: Rebels, and listen to me call out my friends Jayson Krebsbach and Adam Pawlus with regards to the Saga Legends line. I also talk about a new development in JTA"s exciting rumor report! Oh, and I try to squeeze two "upcoming" TBS figures out of Dan Curto, my brother from another mother! Was I successful? You be the judge!! The Gentle Giant Jumbo Vintage Kenner Figure line brought us another jumbo reproduction of one of the top targets of Vintage collectors: Blue Snaggletooth. Click below for our featured look at this awesome tribute to this figure in our detailed Visual Guide. Need to find out even more on this figure? Read our full review found right here in our Research Droids Reviews database! Pre-order the new Gentle Giant Darth Vader Maquettes at Brian's Toys! These new maquettes are based off the hit books "Darth Vader and Son" and "Darth Vader's Little Princess". These maquettes are scheduled to be delivered just in time for Father's Day! 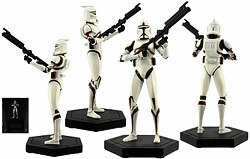 The Black Series 6-inch Wave 2 is finally in stock! Order your set which includes Boba Fett, Slave Leia, Han Solo and Greedo. Wave 1 will also be returning soon, so be sure to get your pre-order in now. Finally, there is also a LEGO Ultimate Millennium Falcon #10179 in stock right now! This is the biggest LEGO model ever made and is one of those most desired sets by collectors and hobbyists the world over. To see more from this week's newsletter, including a great selection of Vintage 12-Back AFA figures, visit Brian's Toys! The controversial Saga Legends line is dividing the collecting community. One of the better figures in the line arguably is the Stormtrooper. How does he fare in comparison to the others? Find out in our Research Droids Reviews today. Be sure to leave your own thoughts in our comments section, vote in the poll or even leave comments about it on our Facebook page. Click the banner below for the direct link to the review! As always, you can also send your own personal review requests via email if you'd like to see something that we didn't cover yet. Our next entry into the The Black Series Visual Guide is the 6" scale Luke Skywalker (Bespin Fatigues). Click below for the full details on one of the newest figures from this line—and find out all of the good, the bad, and the ugly details in our Research Droids Review! There is another.... new line of action figures coming? While not confirmed yet, see what we saw for yourself, as "new images" from Star Wars: Rebels appears on YouTube!! UPDATE: We seemed to have confused you more than we intended to tease you, so we'll be clearer here. The YouTube video is fan made. The card back art in the video is fan made. "If" there is a new line of figures, it may or may not be called Mini Wars (unlikely). But again, stay close as we believe more will be revealed "if" there is a new line of figures coming, and "perhaps" in a smaller scale. Is that better? Our friends at Jedi News are attending the UK Toy Fair as we post this article. Be on the lookout for a report from James and Matt as soon as they are able. No pictures were allowed to be taken, so this is a report you're going to have to read. We'll update links as we learn more too! 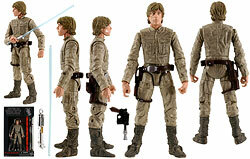 And here is the official RDR entry for The Black Series 6" Luke Skywalker [Bespin Fatigues]. Check it out again in our Research Droids Reviews today. Be sure to leave your own thoughts in our comments section, vote in the poll or even leave comments about it on our Facebook page. Click the banner below for the direct link to the review! As always, you can also send your own personal review requests via email if you'd like to see something that we didn't cover yet. We're taking a small break from our Jumbo Vintage Kenner Figure updates to bring you the latest from Wave 3 of The Black Series 6" line. First up is the incredible Stormtrooper. Click below to check out the Visual Guide for this (must-have) figure, and in case you missed our Research Droids Review launched earlier today, visit it right here! Check in with the latest Big Bad Toy Store newsletter. You can also get daily product news and updates by subscribing to BBTS's Facebook page and Twitter feed! Rumor Report: The Black Series Wave 4 And Wave 5 Revealed? Our Research Droids have dug a little bit deeper into our previous rumor report and we believe they may have uncovered the fourth and fifth waves of figures for The Black Series 3.75” line. Click through for more! Here is the official RDR entry for The Black Series 6" Stormtrooper. Check it out again in our Research Droids Reviews today. Be sure to leave your own thoughts in our comments section, vote in the poll or even leave comments about it on our Facebook page. Click the banner below for the direct link to the review! As always, you can also send your own personal review requests via email if you'd like to see something that we didn't cover yet. We are thrilled to present with you a slightly early look at two of the new wave 3 The Black Series 6" figures: Stormtrooper (#09) and Luke Skywalker [Bespin Fatigues] (#11). The reviews aren't entirely completed yet, but most of the good stuff is already in place, like huge photo galleries and Collector Notes. Visual Guides are moments away too, so please enjoy! Don't forget to leave your thoughts on these figures in our comments! One of the most sought after basic figures from the Vintage era, Yak Face is usually takes center stage on the shelf with the rest of your Vintage collection. Gentle Giant did a masterful job on this San Diego Comic Con exclusive Jumbo Vintage Kenner Figure—complete with a jumbo coin! Click below to check out our Visual Guide for this figure. You can also read our full review right here! Naturally, we gave this figure five stars! Well. It looks like the 41st Elite Corps Clone Trooper did indeed see a running change. The bad news? It's still wrong! Our friends at StarWarsFiguren.com have the full details! Well, the new Saga Legends Clone Commander Cody is kind of a mess. If Hasbro saved money on the reduced articulation tooling, then why couldn't they divert some of their saved pennies to give the figure a significantly better deco? Find out why we're disappointed in our Research Droids Reviews today. Be sure to leave your own thoughts in our comments section, vote in the poll or even leave comments about it on our Facebook page. Click the banner below for the direct link to the review! As always, you can also send your own personal review requests via email if you'd like to see something that we didn't cover yet. Tonight we introduce our first Jumbo Vintage Kenner Figure to the Gentle Giant Visual Guide. Click below to check out the Boba Fett [Rocket Firing] Jumbo Figure. An awesome reproduction to the original, almost unattainable, Vintage Rocket Firing Boba Fett prototype figure. When you are finished checking out our Visual Guide, be sure to catch up on our fully-featured review right here! Here is another minimally articulated figure "for your kids" and "not for you". See Captain Rex for the first time in realistic style, but with only five points of articulation. It's all in our Research Droids Reviews today. Be sure to leave your own thoughts in our comments section, vote in the poll or even leave comments about it on our Facebook page. Click the banner below for the direct link to the review! As always, you can also send your own personal review requests via email if you'd like to see something that we didn't cover yet. The McQuarrie Concept series of mini busts have been the exclusive hightlight of the past 5 years years from Gentle Giant. 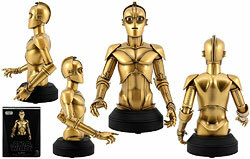 Tonight we feature 2013's exclusive: C-3PO (McQuarrie Concept). Click below to check out another incredible addition to this line. We also have our full review for this mini bust available right here. Any guesses what 2014's will be? JTA moderator Sjefke has made an unbelievable custom of Cane Adiss. It's a figure that Hasbro said they would like to make one day, but sadly that may never pan out. Sjefke didn't want to wait around, so he developed his own. Click through to see how he did it. It feels like it's worthy of some sort of award, no? UPDATE: Congratulations Sjefke! His entry of Cane Adiss was the Grand Prize winner of Yakfinities #50! Saga Legends Wave 2 Are Everywhere But My Area! Well, I don't know how I missed all of these store reports, but we have about five individual reports of Saga Legends wave 2 found at various parts of the country, mostly at Toys R Us stores. I have yet to see these in person, but keep letting us know what you're finding out there. Special thanks to JTA readers Nicholas S., Sean B. and Michael W. for the recent reports! Click through for more. Saga Legends Wave 2 Hits Texas! JTA reader GeneralKoda66 alerts us that the second wave of Saga Legends has hit Texas too. Click through for more! JTA/Yakface.com reader Tsui Choi asked us to share two of his recent Photo Novels. Check out Alliance Intelligence: Chapter 12 and Alliance Intelligence: Chapter 13 in Yakface.com's forums! In today's collecting age, store reports can vary from one extreme to another. There is absolutely nothing in the Philly area, yet JTA moderator Bombadgungan has found a plethors of stuff in his area. Click through for his full report! JTA reader and expert customizer Carl sends us hit latest work: The Mos Eisley cantina. It's gorgeous and you must check it out! Click through for more! Lucasfilm Ltd. has opened a themed creativity center in Singapore. Click through for details! The Clone Wars "Season 6" Details Leaked? Our good friends at JediNews.co.uk has a German translated article to share with fans of The Clone Wars surrounding "Season 6". You're going to want to read this one folks! Turn That Luminara Frown Upside-Down! JTA reader and Luminara lover Scott sends us avery simpole but practical tip to make her headdress stay on without issue. Click through for details. JTA sponsor Dorkside Toys writes in with the latest arrivals, pre-orders and clearance items! Click through for the latest! It's been a whirlwind with Sideshow Collectibles lately. We blew through a whole bunch of recently released incredible collectibles, so we thought we'd quickly recap some of the best pieces worthy of consideration for you own Star Wars collection. These things get released at such a brisk rate it's hard to catch up with them all. For complete details on Chewbacca (Premium Format Figure), Darth Malgus (Premium Format Figure), Clone Commander Wolffe (104th Battalion) (1:6 Scale Figure), Darth Vader [ROTJ] (1:6 Scale Figure) or Darth Malgus (The Old Republic) (1:6 Scale Figure), click any thumbnail below to visit our RDRs where you can see a plethora of images and details on why these are some of their greatest efforts to date! Don't worry, some people actually believe that these are strictly for kids, but what Hasbro believes and they believe are two separate things. Is this the test-market line which will eventually leak its way into the "collector-focused" line. We will leave that for you to decide. In the meantime, see Boba Fett from the Saga Legends line in our Research Droids Reviews today. Be sure to leave your own thoughts in our comments section, vote in the poll or even leave comments about it on our Facebook page. Click the banner below for the direct link to the review! As always, you can also send your own personal review requests via email if you'd like to see something that we didn't cover yet. 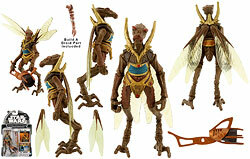 Tonight's Visual Guide update features our last The Clone Wars maquette (for now). Click below to check out this very impressive Savage Opress maquette, and read our full review to find out, while impressive, it didn't quite command a five-star rating from us. It looks like Hasbro has revised the paint operations on the hard to find Stormtrooper SL11 figure. If you recall, our friends at Yakface.com added this figure to their Toyguide, and their sample looks quite a bit different than the one reflected in the image below. They've made the black band along the visor thicker so that is touches the lenses now. Keep your eyes open and let us know which version you're finding out in the wild! Darth Vader may grab more attention in the collecting community, but it was Clone Commander Wolffe (104th Battalion) that struck our fancy. We are THOROUGHLY impressed with this release, and as far as we're concerned it is the impressive, most impressive 1:6 Scale Figure released this year so far. Find out more in our Research Droids Reviews today. Be sure to leave your own thoughts in our comments section, vote in the poll or even leave comments about it on our Facebook page. Click the banner below for the direct link to the review! As always, you can also send your own personal review requests via email if you'd like to see something that we didn't cover yet. The resourceful and brave astromech droid R2-D2 served on many adventures during the Clone Wars conflict. A skilled starship mechanic and fighter pilot's assistant, he formed an unlikely but enduring friendship with the fussy protocol droid C-3PO. Check out Gentle Giant's The Clone Wars style maquette of R2-D2 in our detailed Visual Guide. You can also find our if you need this for your collection by reading our hands-on review right here! Wedge Antilles is making his footprint on the collecting community this week! eFX Collectibles and Gentle Giant have both announced production of the character's replica helmet and mini bust, respectively. You can pre-order both now at Brian's Toys. Also new for pre-order is the Gentle Giant 12" Jumbo Han (Bespin) figure. The Sideshow 12" Darth Vader Deluxe and Stormtrooper Commander Premium Format are due to arrive in the next few weeks. Best to get your order in now before all pre-orders are filled. For more from this week's Brian's Toys newsletter, visit Brian's Toys Newsletter. New Figures Continue To Arrive, So Keep Your Eyes Wide Open! JTA reader, friend and commenter extraordinaire Darth Eddie sends us a happy store report. We have been hearing tales of these figures hitting everywhere, but not in our particular areas yet. It appears there is still hope. Click through for his exciting report! In conjunction with Chronicle Books, Gentle Giant is releasing a pair of (cute) Deluxe Maquettes. Click below to see the full galleries of Darth Vader and Son and Vader's Little Princess. How do they do it? Sideshow Collectibles makes the newest 1:6 Scale Figure better than the previous one. See how far they came with a newly tooled body for the new Darth Vader (Deluxe) 1:6 Scale Figure. It isn't flawless, but it its pretty darn close. Come celebrate our 1700th review with us with an appropriate collectible to fit that landmark. Full details await you in our Research Droids Reviews today. Be sure to leave your own thoughts in our comments section, vote in the poll or even leave comments about it on our Facebook page. Click the banner below for the direct link to the review! As always, you can also send your own personal review requests via email if you'd like to see something that we didn't cover yet. Pre Vizsla was a defender of the Mandalorians' historic past as warriors that had once fought against the Jedi Order. Recognizing the Mandalorians' previous culture and what he believed they should be, Vizsla possessed a strong desire to return Mandalore and its people to that reality by leading the Death Watch in its campaign to take control of the Mandalorians' homeworld. Check out the Gentle Giant Pre Vizsla maquette in our detailed Visual Guide, and read our complete review of this collectible right here in our Research Droids Reviews! Gentle Giant sends in their latest announcements. Click through to check out the press release and photos of the upcoming Han Solo (Bespin Outfit) Jumbo Vintage Figure and the Wedge Antilles Mini Bust! Welcome to our next Q and A of the Day post! This column will be published daily, weekly, monthly, or just based on how many questions I get emailed – but no more than one a day. Feel free to send in your questions and I will put them in the queue. Click through for Q and A of the Day: Day 43. Topic: Are you sitting on some breaking news? Wow. Even if you don't collect them, you should still check out the AT-RT (All Terrain Recon Transport) (The Clone Wars) Maquette. It's one of Gentle Giant Ltd.'s greatest accomplishments to date. While it will be difficult to secure one since it has an edition size of only 200 pieces, it will be worth if you can in the long run. Find out more in our Research Droids Reviews today. Be sure to leave your own thoughts in our comments section, vote in the poll or even leave comments about it on our Facebook page. Click the banner below for the direct link to the review! As always, you can also send your own personal review requests via email if you'd like to see something that we didn't cover yet. 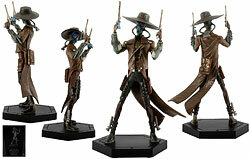 Cad Bane could easily be called a veteran of his craft. He was a menacing mercenary and a ruthless bounty hunter. His notoriety placed him amongst the most vile of villains in the galaxy, and thus a favorite freelancer of the Empire for many of their dirty dealings. Click below to visit our detailed Visual Guide for this awesome Gentle Giant maquette. 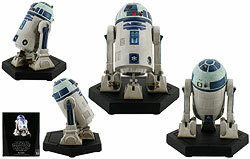 You can also revisit our review of this collectible in our Research Droids Review database! Big Bad Toy Store sends in their latest newsletter. Click through for the full read. You can also get daily product news and updates by subscribing to BBTS's Facebook page and Twitter feed! 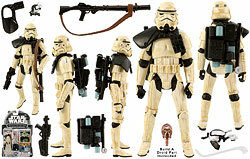 Rebel Soldier (Echo Base Battle Gear) (VC68) Also $19.99! 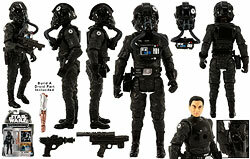 The same seller also has the Rebel Soldier (Echo Base Battle Gear) (VC68) figure for $19.99! Currently there are four left of these figures! Hurry! It's The Cheapest We Have Seen The TVC Ponda Baba For On eBay! Hurry! With special thanks to JTA reader Frank for alerting us to this eBay auction, grab The VIntage Collection's 2011 Ponda Baba (Walrus Man) (VC70) for $19.99 plus FREE shipping. There are two pieces left! We have decided to "retire" the RDR Recap after today. This recap completes all reviews posted in 2013. A new year means no more recaps. Click through for our final Research Droids Reviews recap. Despite the film being called Attack Of The Clones, there really weren't many inaugural clones offered in the 2002 Star Wars "Saga" line. And the Clone Trooper wasn't anything to write home about either. Find out more in our Research Droids Reviews today. Be sure to leave your own thoughts in our comments section, vote in the poll or even leave comments about it on our Facebook page. Click the banner below for the direct link to the review! As always, you can also send your own personal review requests via email if you'd like to see something that we didn't cover yet. Celebration V brought us the release of one of the coolest The Clone Wars Maquettes so far: Bossk. Click below to check out our detailed Visual Guide for a look at this fantastic collectible, and read our full Research Droids Review to see why we gave this 5 of 5 stars! The 2002 Star Wars "Saga" Zam Wesell (Bounty Hunter) figure has a much better feature than The Vintage Collection version (in our opinion). While the packaging is a misnomer (two characters in one), the execution of the "disguise" is really something else. Find out more in our Research Droids Reviews today. Be sure to leave your own thoughts in our comments section, vote in the poll or even leave comments about it on our Facebook page. Click the banner below for the direct link to the review! As always, you can also send your own personal review requests via email if you'd like to see something that we didn't cover yet. Starting tonight we are going to switch gears with our Visual Guide updates and feature some of the hi-end collectibles starting with Gentle Giant. The Coruscant Guard (The Clone Wars) Maquette is first up. Click below to check out this cool rendering of this character in the animation style of The Clone Wars. And, If you missed this review you can catch up on it right here in our extensive Research Droids Reviews database! A friend of mine at work has a friend with a five year old Star Wars fan. The little boy asked his dad to make a Star Wars movie.... so they made one. Definitely check out this adorable (and funny) video by clicking through!! Did you know Hasbro made a Buzz Lightyear action figure? It's true, but they disguised him in a Hoth Rebel soldier's uniform. He is also a pee-wee, so much so that he can be your 1997's POTF2 Hoth Rebel Soldier's action figure too! As you can tell, we're not very fond of 2004's (technically 2003's) Hoth Trooper (Hoth Evacuation) action figure. See why in our Research Droids Reviews today. Be sure to leave your own thoughts in our comments section, vote in the poll or even leave comments about it on our Facebook page. Click the banner below for the direct link to the review! As always, you can also send your own personal review requests via email if you'd like to see something that we didn't cover yet. TC-70 (Jabba The Hutt's Protocol Droid) is a perfect example of what the Build A Droid pack-in is all about! Check out our final update to the Amazon.com Exclusive Droid Factory set in tonight's Visual Guide by clicking the image below. And if you missed it, you can also read our thoughts on this BAD in our Research Droids Review! Make sure to stop by the Legacy Collection  Visual Guide if you missed any of our guides this past week! JTA reader Jub Goobles reports in to let us know that the Mission Series wave 2 figures are hitting his areas, as well as remnants of what's left for The Black Series line. While I am indeed envious, I can tell you that all of the Walmarts in my area look like his third image, including the dried out silly string on the peg wall. Click through for his report! JTA reader Paul H. The Lesser sends readers an idea to an awesome, yet simple way to help build some quick dioramas for your Star Wars figures. Check it all out by clicking through! JTA sponsor writes in to alert readers to new arrivals, pre-orders and clearance merchandise. Click through for fulld details! Look what JTA reader Matt H. in the UK found at a discount chain. Matt, that FX-7 figure is one of Hasbro's finest achievements. I hope you picked a few up! Click through for more. The Most Sideshow Collectibles Featured In A TV Episode Yet! It's hard to respect the reduced scale Boba Fett's Slave I, especially since during the holidays it was possible to get the full size TVC version for only a few dollars more, with a plethora of more play features and details. This scale may work for Jedi starfighters, but we don't know why Hasbro would attempt to get this larger Slave I vehicle forced into the scale also. See our analysis in our Research Droids Reviews today. Be sure to leave your own thoughts in our comments section, vote in the poll or even leave comments about it on our Facebook page. Click the banner below for the direct link to the review! As always, you can also send your own personal review requests via email if you'd like to see something that we didn't cover yet. 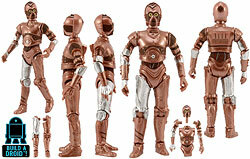 Sun Fac is the final carded figure from the Amazon.com Exclusive Droid Factory set to be added to our Visual Guides. Click below to check this guide out, and read our review to find out why this figure received such a high score in our minds! JTA reader and author Geof Montfort writes in to share the release of his new book The French Connection, featuring Star Wars French materials published in press for the young between 1977 and 1986. Click through to check it out! This is a unique look into the world of advertising our beloved Vintage products. Thanks for bringing this to our attention Geof! All we can say is "WOW!" with regards to Sideshow Collectibles' stunning new Darth Malgus (The Old Republic) 1:6 Scale Figure. Fans of the video game, this figure is for YOU! See why in our Research Droids Reviews and learn more. Be sure to leave your own thoughts in our comments section, vote in the poll or even leave comments about it on our Facebook page. Click the banner below for the direct link to the review! As always, you can also send your own personal review requests via email if you'd like to see something that we didn't cover yet. The Amazon.com Exclusive Droid Factory set brings us the next rendition of the Sandtrooper (the black pauldron corporal) to our troop ranks. Click below for the complete Visual Guide to see what is different (and the same) about this version of the Sandtrooper, and for complete details and everything you need to know about this figure please stop by and read our Research Droids Review! Sideshow Collectibles has announced that the Han Solo (Hoth Outfit) figure is joing their Sixth Scale lineup. This figure compliments the recent Luke in Hoth Outfit and Taun Taun (Deluxe) sixth scale figures, and all three can be pre-ordered at Brian's Toys now! Several No Reserve auctions are ending this Sunday, January 12th, 2014. Place your bids on an uncirculated MISB Vintage Scout Walker (Bi-Logo) AFA 80 and a Vintage Kenner Indiana Jones AFA 60! Last but not least, we have a Master Replica Boba Fett full-scale blaster replica and an eFX Vader Helmet back in stock on the site. For more from this week's newsletter, including a last chance on free shipping via UPS Ground, visit Brian's Toys Newsletter. We spent a great deal of time on the members of the Fett family, but now it's time to check out their ride. Jango Fett's Slave I vehicle was all-new in 2002. How does it fair today? Find out in our Research Droids Reviews and learn more. Be sure to leave your own thoughts in our comments section, vote in the poll or even leave comments about it on our Facebook page. Click the banner below for the direct link to the review! As always, you can also send your own personal review requests via email if you'd like to see something that we didn't cover yet. 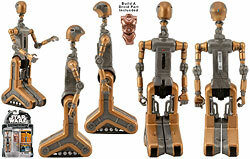 Tonight's Amazon.com Exclusive Droid Factory Visual Guide features our first all-new figure: FA-4. Click below to check out this Build A Droid turned carded figure, and find out all the details about this figure in our Research Droids Review. Well, in a bizarre move that is likely to make even the most die-hard Sideshow Collectibles collectors angry, Sideshow has launched their pre-order of Captain Han Solo (Hoth)—one with a blue coat, one with a brown coat. Instead of packing in the alternate color coat as an exclusive item, you have to buy two figures to get both versions. With prices as high as they are this move is (in our opinion) a really bad one! Nevertheless, you can check out each version by clickiing the images below! They are both up for pre-order right now! Uh-oh. There is no way this is going to make all Star Wars fans happy, is it? Lucasfilm gets its Star Wars stories straight! There have been plenty of new reports already discrediting this, so be mindful of what you read. JTA is only directing yout to these articles. We have no idea what the truth is at this point. Buyer beware. Click through for more. Yahoo news has the story. Our friends at Yakface.com have released an all-new Photo Novel entitled Depths Of Despair. Be sure to check out this beautiful art! The Black Series Wave 3 Hits Walmart! Apparently this is bigger news than our rumor report, but The Black Series wave 3 is hitting Walmarts on the East coast. Our own darthpurge sends us photographic evidence of the news. This confirms yesterday's report at JediDefender.com. Click through for more. Another great likeness of Jango Fett can be found in Jango Fett (Slave I Pilot) from the Star Wars "Saga" line. Too bad the figure itself has a huge action feature. Learn more in our Research Droids Reviews and learn more. Be sure to leave your own thoughts in our comments section, vote in the poll or even leave comments about it on our Facebook page. Click the banner below for the direct link to the review! As always, you can also send your own personal review requests via email if you'd like to see something that we didn't cover yet. Rumor Report: The Return Of The Vintage Collection? Our Amazon.com Exclusive Droid Factory Visual Guides continue, and tonight we feature the Black Squadron TIE Pilot. How does this figure hold up? Click below to check it out for yourself, and see how we rated him in our fully detailed Research Droids Review! One of the best Jango Fett action figures of all time was released in 2002. It's definitely dated, but it still looks fantastic even after a decade. 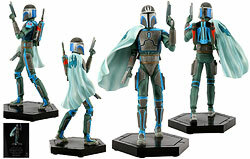 If you don't know about Jango Fett (Kamino Escape) (the very first release of this sculpt – there are many), now is the time to plug into our Research Droids Reviews and learn more. Be sure to leave your own thoughts in our comments section, vote in the poll or even leave comments about it on our Facebook page. Click the banner below for the direct link to the review! As always, you can also send your own personal review requests via email if you'd like to see something that we didn't cover yet. 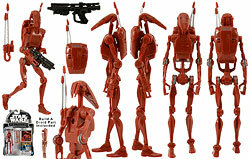 Next up for our Amazon.com Exclusive Droid Factory Visual Guides is the maroon-flavored Battle Droid. Click below to check out this version based on the new TVC sculpt, and check out our thoughts on this droid in our Research Droids Review. The Clone Wars Finale: Coming To Comics! The Star Wars: The Clone Wars finale.... is releasing in comics! Newsarama.com has the full story! Special thanks to JTA reader Mike_5555 for alerting us to this breaking news story! We're on the fence with Boba Fett (Kamino Escape). It's just an OK action figure, but why does he come with so many screen inaccurrate accessories? We're not so sure about that one, or are we?. See more in our Research Droids Reviews today. Be sure to leave your own thoughts in our comments section, vote in the poll or even leave comments about it on our Facebook page. Click the banner below for the direct link to the review! As always, you can also send your own personal review requests via email if you'd like to see something that we didn't cover yet. It's time to run a mini-marathon of Visual Guides featuring the Amazon.com Exclusive Droid Factory figures. 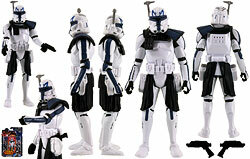 First up we take a look at the 212th Battalion Clone Trooper. Click below to check out the full Visual Guide, and if you missed this review a few months back then click here to get caught up! A surprising all-new sculpt, Watto (Mos Espa Junk Dealer) may or may not interest you for your own Star Wars collection. Find out more in our Research Droids Reviews today. Be sure to leave your own thoughts in our comments section, vote in the poll or even leave comments about it on our Facebook page. Click the banner below for the direct link to the review! As always, you can also send your own personal review requests via email if you'd like to see something that we didn't cover yet. Welcome to our next Q and A of the Day post! This column will be published daily, weekly, monthly, or just based on how many questions I get emailed – but no more than one a day. Feel free to send in your questions and I will put them in the queue. Click through for Q and A of the Day: Day 39. You may not like the Special Editions of the classic Original Trilogy, but you can't deny that Rappertunie (Jabba's Palace) is a great action figure. See why in our Research Droids Reviews today. Be sure to leave your own thoughts in our comments section, vote in the poll or even leave comments about it on our Facebook page. Click the banner below for the direct link to the review! As always, you can also send your own personal review requests via email if you'd like to see something that we didn't cover yet. Welcome to our next Q and A of the Day post! This column will be published daily, weekly, monthly, or just based on how many questions I get emailed – but no more than one a day. Feel free to send in your questions and I will put them in the queue. Click through for Q and A of the Day: Day 38. This Obi-Wan Kenobi (A New Hope) Star Wars Animated Maquette by Gentle Giant Ltd. looks a little too young, but honestly isn't half that bad See the piece in detail in our Research Droids Reviews today. Be sure to leave your own thoughts in our comments section, vote in the poll or even leave comments about it on our Facebook page. Click the banner below for the direct link to the review! As always, you can also send your own personal review requests via email if you'd like to see something that we didn't cover yet. 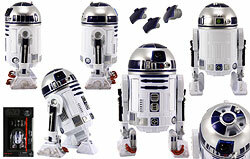 Our first Visual Guide of 2014 fills in our only hole in The Black Series six inch line: R2-D2. Click below to check out the full guide, and make sure to catch up on the review for this figure right here! Lucasfilm officially announced the return of Star Wars Comics to Marvel today. Starting in 2015 Dark Horse will no longer being creating your favorite Star Wars Expanded Univers stories. Not a surprising move considering Disney owns Marvel. Click through for the full press release, and weigh in in our comments section on your thoughts on this big switch! Welcome to our next Q and A of the Day post! This column will be published daily, weekly, monthly, or just based on how many questions I get emailed – but no more than one a day. Feel free to send in your questions and I will put them in the queue. Click through for Q and A of the Day: Day 37. JTA reader Nicholas S. also sends us a Saga Legends wave 2 report from PA! It looks like they can be found from East to West now! Click through for more details. Saga Legends Wave 2 Infiltrates Toys R Us! JTA reader and Facebook friend Sean B. sends us proof that Saga Legends wave 2 has also hit Toys R Us. Best get out there, or those of you not buried in snow at the moment at least! Click through for more. Amazon.com has dropped the price of the Star Wars: The Complete Saga Blu-ray set. If you haven't picked this up yet this is a great price! Big thanks to JTA reader Michael for sending in the report! Another Maquette by Gentle Giant Ltd. that has been done very well is Darth Maul (Star Wars Animated), loosely based on The Phantom Menace concept art, and a few other sources too. See the piece in detail in our Research Droids Reviews today. Be sure to leave your own thoughts in our comments section, vote in the poll or even leave comments about it on our Facebook page. Click the banner below for the direct link to the review! As always, you can also send your own personal review requests via email if you'd like to see something that we didn't cover yet. Saga Legends Wave 2 Hits Fred Meyer Out West! Wow! Wave 2 of the Saga Legends line has hit Fred Meyer on the West Coast. Does this mean that it might be hitting widespread soon too? Click through for more! Sideshow Collectibles officially previews the Captain Han Solo (Hoth) Sixth Scale Figure with the release of their latest newsletter. Click through for the full preview page. This will go up for pre-order next week (January 9th), and if the tease in their newsletter is any indication we will get both blue and brown jacket options. One Maquette by Gentle Giant Ltd. that still stands the test of time is the Emperor Palpatine (Star Wars Animated) collectible. If you don't own this piece, you should. Learn about what makes this piece so special in our Research Droids Reviews today. Be sure to leave your own thoughts in our comments section, vote in the poll or even leave comments about it on our Facebook page. Click the banner below for the direct link to the review! As always, you can also send your own personal review requests via email if you'd like to see something that we didn't cover yet. No New DPCI For TBS! Repeat: No New DPCI For TBS! As a follow-up to our report from Gary, another TARGET informant sends us proof that there is no new DPCI for The Black Series for the new TARGET reset. Click through for more! The Black [Hole] Series? TBS Gets Lost In The TVC Shuffle? We have an inside TARGET report about an impending reset. And guess what's not on it? Special thanks to JTA reader and TARGET source Gary H. for the insightful information. Click through for more. Jedi Temple Archives Celebrates A Decade On The Web! Jedi Temple Archives kicks off 2014 with a slightly new look to the front page, featuring a new banner layout commemorating our first decade on the web! A big thanks to all of our viewers for ten great years! Stay with us all through 2014 and beyond as we continue to bring you the web's best Research Droids Reviews, Visual Guides, and Star Wars news! We will continue to be your best source of news and reviews (without all the gimmicks and hijinks) well into the future! The Holographic Darth Sidious (With Mechno-Chair) 1:6 Scale Figure was the very first collectible of this character by any licensee. It's the focus of our Research Droids Reviews today. Be sure to leave your own thoughts in our comments section, vote in the poll or even leave comments about it on our Facebook page. Click the banner below for the direct link to the review! As always, you can also send your own personal review requests via email if you'd like to see something that we didn't cover yet. Big Bad Toy Store is ringing in the New Year with their latest newsletter... You can also get daily product news and updates by subscribing to BBTS's Facebook page and Twitter feed! Jedi Temple Archives wishes you and yours a very Happy New Year!